Asthma is an inflammatory condition which affects the lungs in negative ways. It is not a single disease, but a group of symptoms that arise from the abnormal immune responses to environmental triggers. Asthmatics suffer from limited air flow, difficulties in breathing, heightened sensitivity to particles or toxins in the air, wheezing, coughing, and tightness of the throat and chest. Asthma can be triggered by allergens, air-borne pollutants, upper respiratory infections (like a cold or the flu), exercise, and nonsteroidal anti-inflammatory drugs, such as acetaminophen. The cells that line the airways, the epithelium, are the first point of contact when particles are inhaled. Until recently, scientists were unaware that these cells contribute to inflammatory responses within the lungs. Scientists are busily trying to clarify the role of over 50 different cytokines that are involved in regulating the amount of lung inflammation that asthmatics experience. When challenged with antigens, lung cells produce great numbers of inflammatory cytokines, immune messages. These immune factors regulate the activity of genes that result in inflammation and the body’s efforts to control inflammation. Inflammatory cytokines increase the levels of inflammation to help the body remove the antigens, while other cytokines dampen excessive immune responses, trying to bring inflammatory responses back to balance. 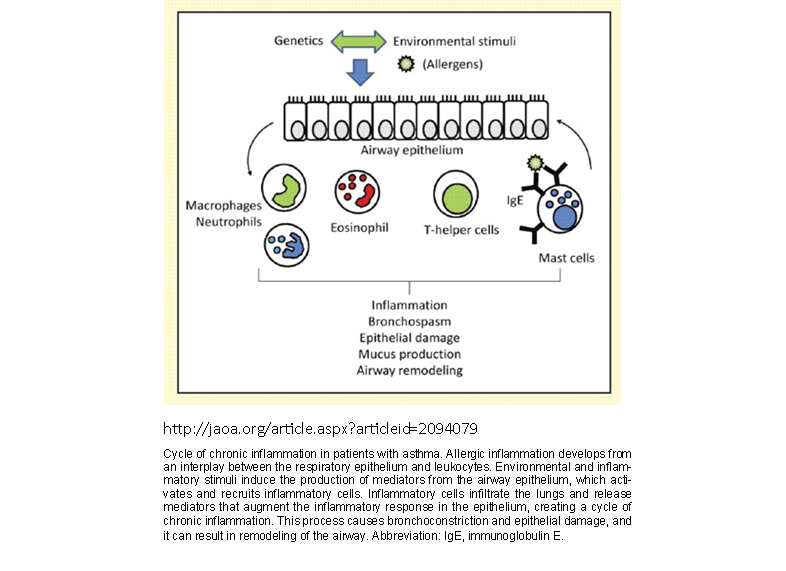 Structural changes in the airways result from the actions of different classes of inflammatory cells and their immune proteins and biologically active molecules. Lung cells can also release molecules that cause the muscles and blood vessels in the airways to become stiff and narrow. The lungs become overly sensitive to environmental stimuli triggering the production of excessive levels of mucus, perhaps to help dilute and wash antigens out. These fluids can clog the airways of the lungs making it even more difficult to breathe. The hypersensitivity of the lungs results in a vicious cycle of over-active immune reactions, inflammation, and more mucus production. As always the key to healthy immune support is balance. The body needs to produce enough inflammation to help us heal and protect us from external and internal challenges, but the inflammatory response must be well balanced and controlled. Dr. Hellen’s major passion in life is helping people get more energy, become more productive, and enjoy life at its fullest. She may be contacted by using this form, drhellen@drhellengreenblatt.info, or at: 302.265.3870 (ET, USA).